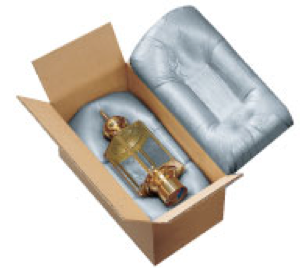 Foam in place packaging is quite popular and an excellent method of protecting valuable uniquely shaped objects safely. Many people have experienced foam in place packaging every day. Adept had a great opportunity being contracted by one of the leaders in the field of foam in place packaging machine development. The simplistic nature of the end use product does not reveal the intricacy and engineering genius required to create this solution. The foam that is encased within the familiar grey plastic is a patented 2 part resin system similar to urethane foam. Each part must be delivered at the correct quantity and temperature. 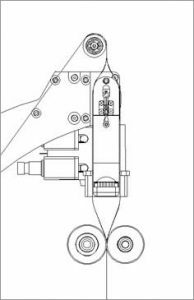 A huge challenger Adept undertook was the design and development of a now patented control valve. A valve capable of mixing the two components while also effectively cleaning itself to avoid clogging. You can read more about that portion of the project elsewhere on our site. The dispenser assemblies’ role was to contain and actuate the valve, regulate the temperature and flowrate of the individual components, while being easy to manufacture, maintain and to be reliable. One of the unique design elements of the Foam Dispenser was its simplistic housing design. 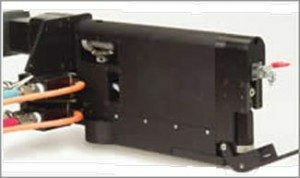 The housing that contains the required components; Brushless DC motor, heatercartridges, bevel gears, universal joints, clutches, crank shafts and more, was conceived of a sole aluminum extrusion. 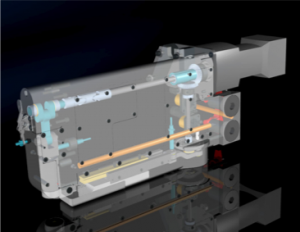 The incorporation of the aluminum extrusion transformed what would have been a multiple component assembly into a single component. The grey film which encapsulates the expanding resin begins as a large 2 ply roll. 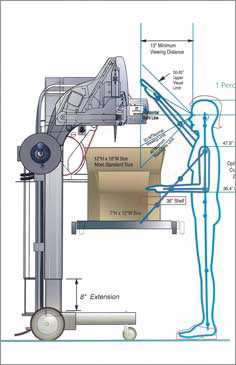 As the film is routed through the machine from its multiple size adaptable spindle, the 2 plies are separated, filled with foam and sealed via resistance heat sealing wires, all before ejecting from the bottom of the machine, delivered to the packager ready for insertion to the subject package. Thousands of machines with this foam dispenser are in use today while Adept’s client enjoys their reliability and effectiveness. 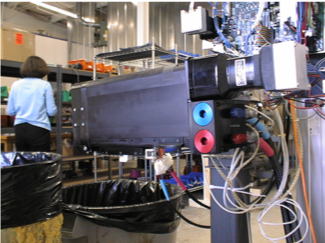 Conceptualize, Design and Analyze a device to heat, mix and deliver as A/B resin between two layers of plastic. Mechanical, Electrical and Industrial Engineering coordination. Detailed Drawing and CAD geometry. Adhere to strict process parameters. Conform to evolving machine layout. 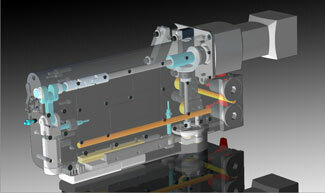 Design for manufacture, low tooling cost.